The premise of the “You Make Me Sick!” online game, which won a $50k prize last week from the National STEM Video Game Challenge, is that middle school kids invent an pathogen and fight the immune system — learning science along the way. 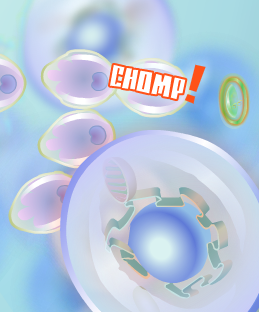 The game steps players through several stages: briefing them on the habits and weaknesses of a target human, devising an evil pathogen (e.g., a virus or bacterium with different transmission means, shapes and characteristics), and playing a short arcade game in the lungs or guts of the human — battling the pathogen against immune cells. The charming game hopes to engage kids in the process of infection, and familiarize them with attributes of pathogens and how infections occur. The game fits typical curriculum standards of middle school (ages 11-14) science classrooms, and is intended to “motivate, engage, and teach a diverse range of students about science.” It’s online, running in web browsers with Adobe Flash version 10, and works on virtually all web browsers in the U.S. The game play itself is a little confusing and the arcade functions are cumbersome, but the overall design successfully draws gamers through, to experience the interplay between the pathogen and the host’s immune system. The game is currently free, though the publisher, Madison, Wisc. based Filament Games, plans to bundle a suite of middle school science games spanning life, Earth, and physical science, and put them behind an “affordable” paywall. The primary source of funding is from the U.S. Department of Education, via their Institute of Education Sciences’ Small Business Innovation Research (SBIR) program. The SBIR program funds commercial ventures that “directly or indirectly lead to improved student learning and academic achievement” but which can’t self-fund because they require too much research or the revenue potential is too small. The contract was awarded to Filament, for $838k. They have 2.5 years to make “six life science computer games on topics including cells, heredity, evolution, bacteria, plants, and the human body.” Filament was also awarded a $150k SBIR from NSF to make games targeting the physical sciences. The game leapt to notoriety because it won $50k in a science video game competition last week. The prize was organized by the Joan Ganz Cooney Center and publisher E-Line Media, riding on publicity from President Obama’s “Educate to Innovate” campaign. One part of the prize challenged middle-school students to design video games on any topic (some of which dealt with science themes). Brian Alspach, vice president of E-Line Media is excited about kids doing game development, saying “we believe that the very act of designing a game has powerful implications for STEM learning.” The second part of the prize challenged emerging and experienced game developers like Filament. The prize organizers had the support of the White House, which promoted the contest on their blog, as well as several nonprofits who promoted the contest via their existing channels. Thanks to that free publicity, the youth prize had 525 entries from imaginative kids (see the youth winners); and 50 entries from emerging and experienced game developers. Last week, Aneesh Chopra, the U.S. Chief Technology Officer, announced a dozen youth winners, and two developer winners. For Filament, the $50k was an unexpected windfall. Their SBIR contract was awarded in July 2010, two months before the challenge was announced, so they had started development already. Filament submitted their web-based game on a whim, since it did not fully comply with the rules of 4-person teams creating mobile-based video games for young children, grades pre-K through 4th. (Filament’s game is not mobile, targets older children, and had a 4-person development team plus several others who chipped in with planning, design, artwork and the soundtrack.) But it turned out that the contest rules were flexible, and contest officials loved the game. The competition was funded by sponsors (AMD Foundation, ESA and Microsoft): $50k for Filament, $50k to a team of graduate students, plus a dozen laptop computers to the youth winners and $24k for schools. The success of the approach for this game is still unknown. The series of games are designed around the Universal Design For Learning (UDL) framework, which the team hopes will help meet the needs of all students. But Marino says, “the teaching methods within the game need additional empirical research.” “There is very little research about how to transfer empirically validated strategies from the classroom into a game.” They will test the games by comparing learning outcomes among kids that play the game vs. kids that are taught via conventional means. Meanwhile, Marino and Filament are continuing with the game pipeline. Their next game, “Prisoner of Echo” is about sound, and comes out next month. Check out the “You Make Me Sick!” online game yourself! Update 7-Apr-11: Clarified details about Filament’s contest submission; corrected SBIR contract details. The kids will be aware of how does bacteria affect their health and they will learn new things. a combined idea of entertainment and education. This are great innovation for online games , Not just a game also learning…Keep up the good work ! !